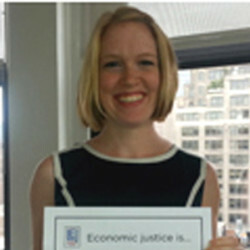 Katie joined NCLEJ as a Post-Graduate Fellow in September 2015. She is a graduate of NYU School of Law, where she was an Executive Editor of the NYU Journal of Law and Public Policy, and the College of William and Mary. While in law school, Katie’s work and studies focused primarily on women’s rights, including participating in the inaugural class of NYU’s Reproductive Justice Clinic.